Astro Holdings purchased cranes as part of Pennsylvania’s $300-million Port Development Plan. This past winter PhilaPort saw the largest containership that ever called the port, a 12,200-TEU vessel. New Philadelphia container cranes capable of discharging containers from new larger vessels. The Port of Philadelphia received its first two super postpanamax cranes at the Packer Avenue Marine Terminal after a ninety-day journey from Shanghai, China. Manufactured by Shanghai Zhenhua Heavy Industries (ZPMC), the new cranes will be 13 feet taller than the neighboring Walt Whitman Bridge with its boom in the upward position. PhilaPort, along with Packer Avenue Marine Terminal’s operator, Astro Holdings, Inc. (a Holt Logistics affiliate), have purchased the cranes as part of Pennsylvania Governor Tom Wolf’s $300 million Port Development Plan to increase cargo-handling capacity and efficiency. In the past decade vessel size has grown exponentially creating a new class of container ships known as ULCVs (Ultra Large Container Vessel) with a 10,000 to 20,000 container capacity. Even before the arrival of the cranes, this past winter PhilaPort saw the largest containership that ever called the Port the M/V MSC Shuba B, a 12,200-TEU vessel. These new container gantry cranes will be capable of discharging containers from these new larger vessels and have a cost of $12 million each. In November of 2016, Wolf announced a $300 million Port Development Plan. As part of the plan, Packer Avenue Marine Terminal operator, Astro Holdings, agreed to purchase one crane, as well as undertake other planned improvements to the facility. 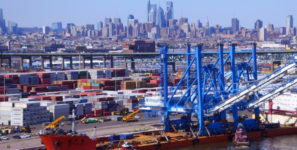 In the first quarter of 2019, PhilaPort will be adding another two identical cranes and Astro Holdings another one crane at Packer Avenue Marine Terminal, bringing the total number of cranes at Packer Avenue Marine Terminal to seven.